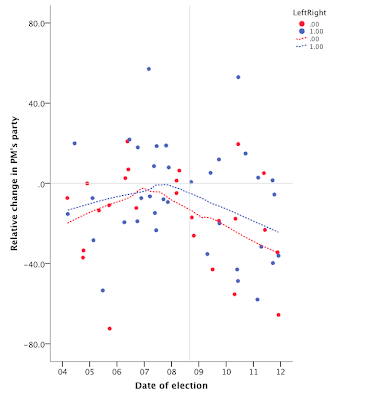 The April issue of French Politics (ungated) is dedicated to several fun articles forecasting the 2012 French elections. 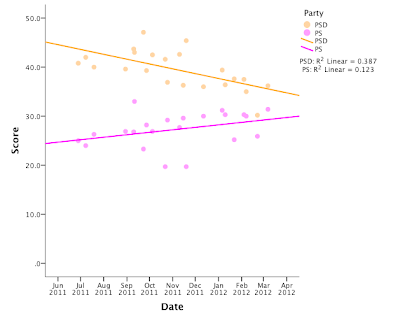 Nadeau, Lewis-Beck, and Bélanger, using simultaneous equations to deal, in the one hand, with the relationship between incumbent popularity and vote for the leftist candidates in the first round and, on the other hand, the relationship between unemployment, time in office, cohabitation, and incumbent popularity, predict that the Left will get a (narrow) majority of the votes in the first round. Nadeau and Lewis-Beck (again) and Didier then take a look at second-round vote as a function of presidential approval measured 4 months before the election and the image of the candidates, and suggest that Sarkozy is in rather bad shape for the second round, albeit not so bad as polls were suggesting a few months ago. 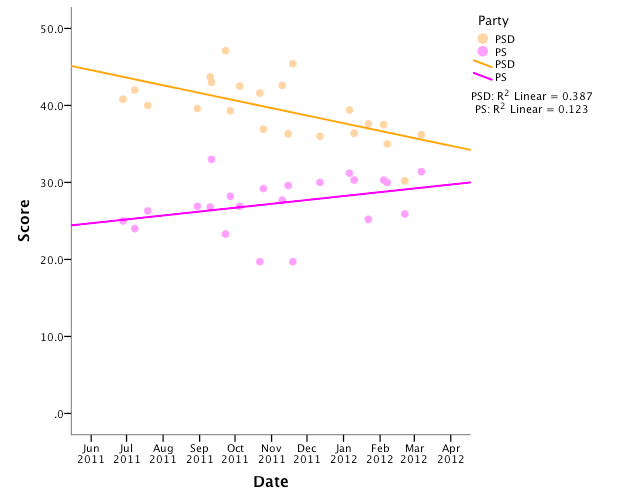 Foucault focuses on legislative elections, using local data on unemployment, national GDP data, PM's popularity, local data again on previous electoral performance of the incumbent, and a couple of other specificities, and concludes that the Left will have a narrow majority of the votes (in the last issue of PS, Foucault and Nadeau also use local data, which is then aggregated and weighted to arrive at a prediction of a - narrow - Sarkozy defeat). 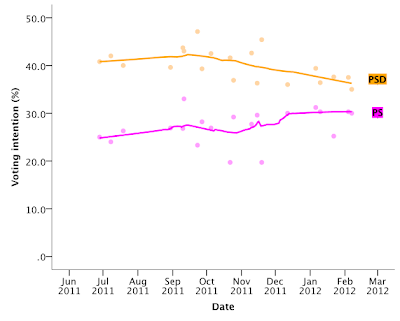 Evans and Ivaldi predict Marine Le Pen with around 17%. 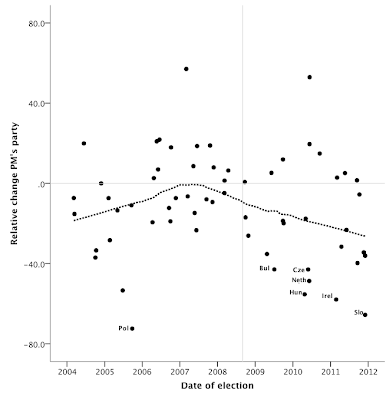 But Jerôme and Jerôme-Speziari, using regional data, actually give a very close advantage to Sarkozy. As one of the papers notes, "a victory in 2012 would certainly qualify Sarkozy as one of the most successful campaigners in modern times." I guess at least that is safe to say. This is the title of a conference jointly organized by the Department of Government and the BMW Center for German and European studies of Georgetown University. April 17th (from 9.30am to 3.00pm) and 18th (10.00am to 5.30pm) at the Edward B. Bunn Intercultural Center, 7th Floor Conference Room. Closing the morning session on the 18th, we'll have Ambassador Nuno Brito, Ambassador of Portugal in the USA. Closing the afternoon session, we'll have Minister Antonio de Lecea, Principal Advisor on Economic and Financial Affairs at the EU Delegation in the USA. Full programme here. Kind support from the Luso-American Development Foundation and from the Endesa Foundation. 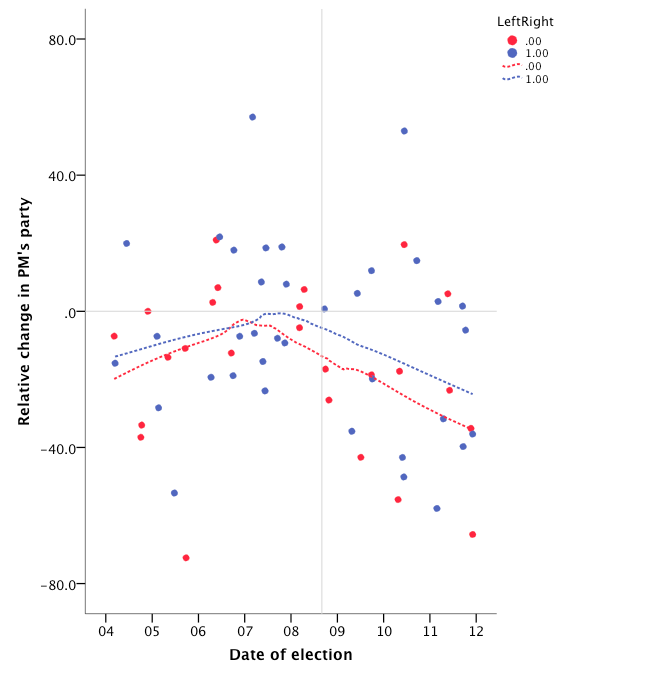 And here's the paper I'll be presenting on the 2011 Portuguese elections. Comments very welcome. "Labour and capital were diverted into activities, such as law, construction, health and government, that are sheltered from foreign competition. The number of lawyers increased by 48% between 2000 and 2010. The public sector grew fast. 'All these people went to study film-making and sociology and then got jobs with the government,' says Pedro Santa Clara of Lisbon’s Nova University. Productivity stagnated." You can find this and more in an obscure publication called The Economist. Let's hope this sociology and film-making people getting government jobs problem is addressed in a revised version of the Troika memorandum. 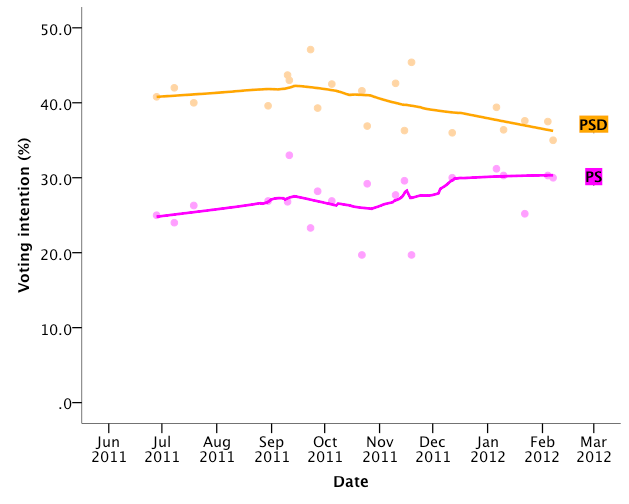 Three new polls since the last time we looked at this: from Marktest, Aximage, and Eurosondagem. 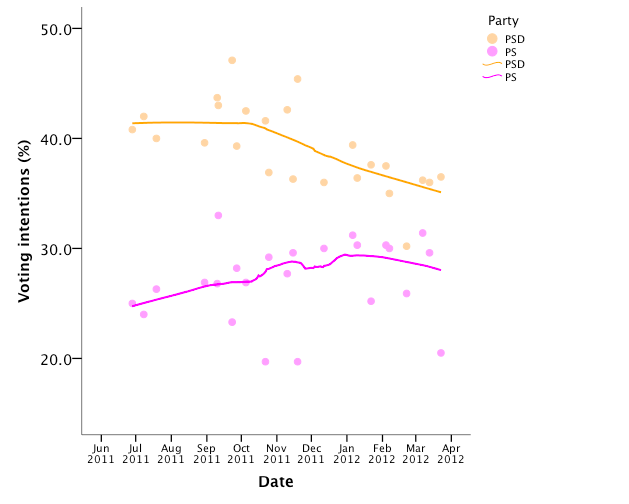 The advantage of the PSD over the PS is now estimated at 7.5 points by Aximage (down from 8.2 in January), at 12.4 points by Marktest (down from 25.7 in November) and at 5 points by Eurosondagem (down from 6.1 in January).